Named New York's state bird in 1970, the Eastern Bluebird is a member of the "Trush" family, numerous species of birds belonging to the songbird family also called "Turdidae". Characteristic of it's name the male bluebird has a bright blue back, head, and wings with rusty brick-red or orange on his throat and breast. Their belly is white. Similar to the male but duller, females are grayish blue above with bluish wings and tail, and a duller orange-brown breast. Their bellies are also white. About 70% of the Eastern Bluebird food intake consists of insects, worms and spiders. In the winter their diet consists of mainly seeds and berries. Eastern Bluebirds mate in spring and summer. They build cup-shaped nests inside old woodpecker holes, decayed trees and even small crevices between rocks, but are quick to take advantage of man made nest boxes placed at the edge of a field or forest. There the female lays two to five speckled eggs. The eggs incubate for about two weeks where the newly hatched birds will remain for up to 20 days. The famale will often lay two clutches per year with both male and female helping raise the young. 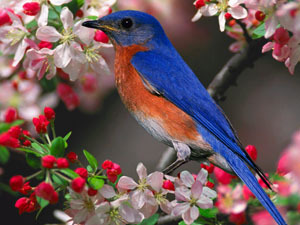 The Robin was initially selected as New York's state bird, but in the 1920's NY Federated Women's Club President, Mrs. Charles Cyrus Marshall led a campaign determining that the bluebird was much more popular. It took 40 years for it to be adopted as the state bird of New York. Sometimes, a young bluebird from the first brood will remain in the nest and assist it's parents in caring for the second. Bluebirds have declined dramatically over the last 100 years, but the numbers have begun a rise with the introduction of nesting boxes by bird enthusiasts. The bluebird is also the official bird of Missouri. They are quite partial to the sound of dripping water, so a birdbath is a good way to attract the birds to your property. A suitable birdhouse or nesting box will convince them to stay and nest. 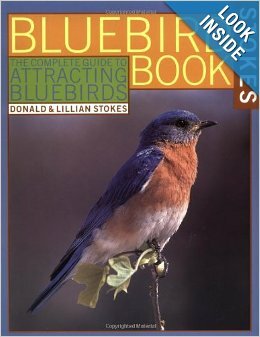 Copiously illustrated with maps, line drawings, and full-color photographs, this large format paperback book contains the essential information that backyard nature enthusiasts want and need -- to attract bluebirds to their yards.